With over 2.5 million weekly “Very Smart Brothas” readers, a GQ column and new Harper Collins book “What Doesn’t Kill You Makes You Blacker,” Damon Young is artfully illuminating life as a black man in 21st century America. Damon shares his take on the role white privilege played in the killing of 17 year-old unarmed black teenager Antwon Rose II by a white former East Pittsburgh police officer, the conversation about homophobia he hopes is sparked by a chapter in his new book, and how systemic inequality has led him to experience the “hyper-cognizance” of his blackness. “We Can Be” is hosted by The Heinz Endowments President Grant Oliphant, and produced by the Endowments and Treehouse Media. Theme and incidental music by Josh Slifkin. Guest image by Josh Franzos. This episode contains adult language. “THERE ARE BLACK PEOPLE IN THE FUTURE," in cut-out white letters on the black background of a steel billboard, stood high above Pittsburgh’s rapidly changing East Liberty neighborhood last spring – and brought national acclaim to interdisciplinary artist and cultural producer Alisha Wormsley. But that science fiction-inspired contribution to The Last Billboard art project – and the controversy its removal sparked – is but one brush stroke in an artistic career that has spanned nearly two decades and numerous continents. “I don’t consider myself an activist,” Alisha says, “but my art is active.” It is indeed active – and vibrant – weaving family history, an archeologist’s sensibility, and a love of sci-fi into photographic, film, mural, performance and multi-dimensional works of art. Learn how a Zora Neale Hurston book about the religious experience of post-emancipation African Americans, her brother’s Marvel comic obsession, and “The Walking Dead” AMC television show have all influenced the smart, moving, beautiful, and absolutely vital art of Alisha Wormsley. In this second episode of a two-part series, Jewish community leaders share their distinct and moving perspectives of what happened on Oct. 27, 2018, when a lone gunman opened fire on worshipers at the Tree of Life synagogue in the Squirrel Hill neighborhood of Pittsburgh. Eleven people were killed in what would become the deadliest attack on the Jewish community in our nation’s history. Host Grant Oliphant speaks with the Jewish Community Center of Greater Pittsburgh’s executive director, Brian Schreiber, and the Center for Loving Kindness and Civic Engagement’s Rabbi Ron Symons. “We Can Be” is hosted by Heinz Endowments president Grant Oliphant, and produced by the Endowments and Treehouse Media. Theme and incidental music composed and performed by Josh Slifkin. Guest and header images by Josh Franzos. The early morning of Oct. 27, 2018, began with promise, ethereally foggy with sunlight shining through the occasional crack in the haze to highlight the fall foliage. Then, at 9:50 a.m., a lone gunman opened fire on worshipers at the Tree of Life synagogue in the Squirrel Hill neighborhood of Pittsburgh, killing 11 people in what would become the deadliest attack on the Jewish community in our nation’s history. In this two-part episode, we will hear three distinct and moving perspectives of what happened that day and in the weeks that followed as the Jewish community, city and country persevered through grief, reckoned with reality, and found that random acts of beauty and unity are the new normal. In part one, host Grant Oliphant speaks with Jewish Federation of Greater Pittsburgh CEO Jeff Finkelstein. The Jewish Federation has assisted Jewish people affected by traumatic events for more than 100 years, and Jeff shares heart-rending details of what he – and fellow Jewish leaders – did in the hours and days after the massacre at Tree of Life was thrust upon Pittsburgh. “We Can Be” is hosted by The Heinz Endowments President Grant Oliphant, and produced by the Endowments and Treehouse Media. Theme and incidental music composed and performed by Josh Slifkin. Guest and header image by Josh Franzos. The story of Hazelwood is a familiar one: A vibrant riverfront community with an industrial past flourished until the late 1980s when the steel industry bottomed out, leaving longtime residents with a decimated economy. But this archetypal American story is different, too, and the Rev. Tim Smith is a big reason why. 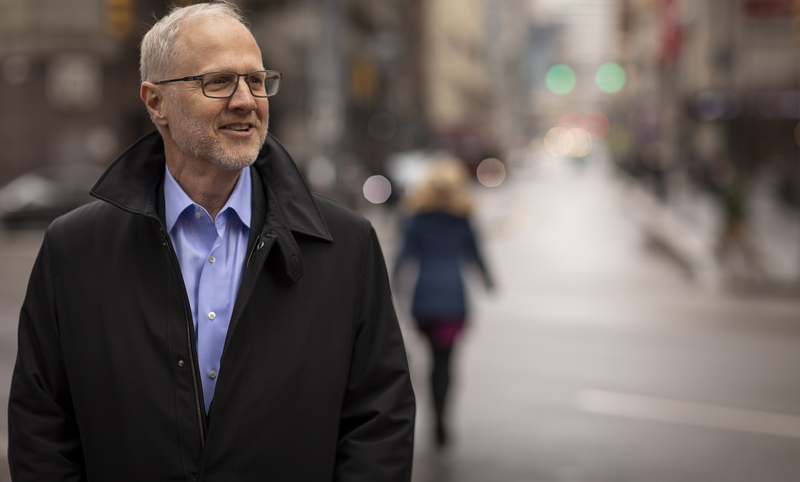 As CEO of Center of Life and pastor of Keystone Church of Hazelwood, Tim has a daily insight into the struggles, hope and beauty of those who are determined to keep the soul of their Pittsburgh neighborhood alive and thriving. Tim sees the intricate interweaving of these individual lives — both their hard times and soaring happiness — blend together to form the fabric of a community he clearly loves. He talks about the single thing that most impacts kids’ lives today, the realization about his own life’s direction that “went all through” him, and why art and music may be key to tipping the scale of his community’s youth toward the good. “We Can Be” is hosted by The Heinz Endowments’ Grant Oliphant and produced by the Endowments and Treehouse Media. Theme music is composed by John Dziuban, with incidental music by Josh Slifkin. Additional music in this episode: "Precious," composed by Ben Clifton for Center of Life Jazz. San Juan, Puerto Rico Mayor Carmen Yulin Cruz is the star of a grainy 8mm home movie that shows her as a toddler in her mother’s arms. Off-screen, her father asks what she wants to be when she grows up. Her answer: “Alcalde de San Juan” – the mayor of San Juan. She did indeed grow up to be the mayor of San Juan, Puerto Rico, and the certainty she exuded as a small child flourished into a strong, confident voice. Yulin showed the world that voice – and came to international prominence - as a tenacious advocate for her city when the government’s relief efforts during the aftermath of Hurricanes Irma and Maria proved devastatingly lacking. She uses her position and power to speak out when the vulnerable are in need, and is making strides as a proponent of green energy policy that just might make Puerto Rico an example of equitable sustainability for the United States and the world. “We Can Be” is hosted by The Heinz Endowments’ Grant Oliphant and produced by the Endowments and Treehouse Media. Theme music is composed by John Dziuban, with incidental music by Josh Slifkin. “We Can Be” is hosted by The Heinz Endowments’ Grant Oliphant and produced by the Endowments and Treehouse Media. Theme music is composed by John Dziuban, with incidental music by Josh Slifkin and Akil Esoon. In 1978, Lois Gibbs was a young mother with a child in a school that was found to be built over a toxic chemical waste dump site. Lois gained international attention and incredible momentum in the late ‘70s and early ‘80s as she led the fight for environmental justice for children and families affected by the environmental disaster identified with the neighborhood where it occurred, Love Canal. “I was waiting on someone to knock on my door and tell me what to do, to explain how I could help,” says Lois of the early days of revelations about the infamous Love Canal dump. Her persistent activism led to passage of the “Superfund” toxic waste site cleanup legislation. Lois went on to found the Center for Health, Environment and Justice, which has helped more than 10,000 grassroots organizations with technical, organizational or environmental education. She appears in the 2018 HBO movie Atomic Homeland and was named a “top environmentalist of the past century” by Newsweek magazine. She has been honored with a Heinz Award and the Goldman Prize for her groundbreaking environmental work. On this 40th anniversary of the Love Canal tragedy, Lois shares how she dealt with being called “a hysterical mother with a sickly child," shares the moment she most clearly saw democracy at its best and the key to success for today’s environmental activists. "Average people and the average community can change the world,” Lois says. “Flint is a story about what happens when the very people that are charged with keeping us safe care more about money or power than they do about you or your children,” says Dr. Mona Hanna-Attisha. “We Can Be” is hosted by The Heinz Endowments’ Grant Oliphant and produced by the Endowments and Treehouse Media. Theme music is composed by John Dziuban, with incidental music by Josh Slifkindental music by Josh Slifkin. A single sentence. A mere 45 words. Those 45 words are the entirety of the First Amendment found in our Bill of Rights, and they have been a powerful cornerstone of our identity and our democracy. “We Can Be” guest Max King has earned his spot as a nationally respected voice on First Amendment issues, which first drew his interest in the pre-social media days of the late ‘70s to late ‘90s when he was a reporter and eventually the editor at The Philadelphia Inquirer. Years later, his tenure as head of The Heinz Endowments and his current position as president and CEO of The Pittsburgh Foundation gave Max keen insight as to how challenges to First Amendment rights play out in the real lives of individuals. Daily scans of news headlines make clear that the First Amendment issues Max speaks of are undeniably threatened in today’s political climate. From misinformed complaints about NFL protests meant to draw attention police brutality against black Americans to relentless attacks on a free press by those occupying the White House, First Amendment concerns are ever-present in our lives. In this episode of “We Can Be,” Max talks with Heinz Endowments president and podcast host Grant Oliphant about what he believes to be the underlying cause of the deep divisions that fuel these threats, the reason the First Amendment matters in our everyday lives, and the role we each have in keeping this backbone of our democracy alive and well. “We Can Be” is produced by the Endowments and Treehouse Media. Theme music is composed by John Dziuban, with incidental music by Josh Slifkin.